Create beautiful, healthy hair from within. 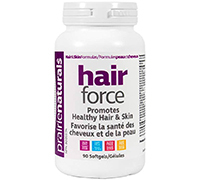 Prairie Naturals Hair-Force synergistically combines 22 natural nutrients recognized for their role in restoring, repairing and nourishing hair. Now you can stimulate maximum growth of the hair follicle while minimizing hair loss. The combined effect of these vitamins, minerals and nutrient co-factors directly counteracts the hair-damaging negatives caused by stress, illness, hormonal imbalances and other health and environmental concerns. Recommended Use or Purpose: Helps to support healthy, thicker hair. Supports healthy skin, nails and hair. Source of silicon for the maintenance of healthy skin, nails and hair. 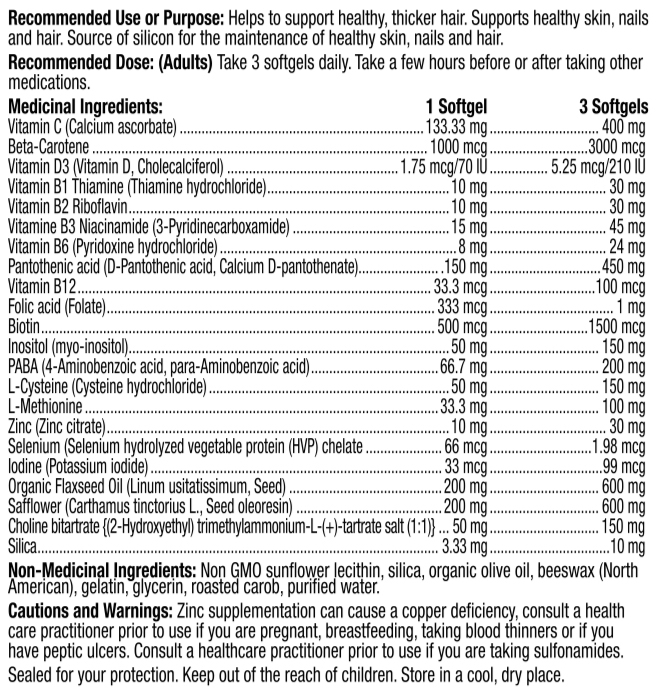 Recommended Dose: (Adults): Take 3 softgels daily. Take a few hours before or after taking other medications.